This week I saw again a PDF containing a malicious Word document with macros (a downloader). I made a video of the analysis of this document. 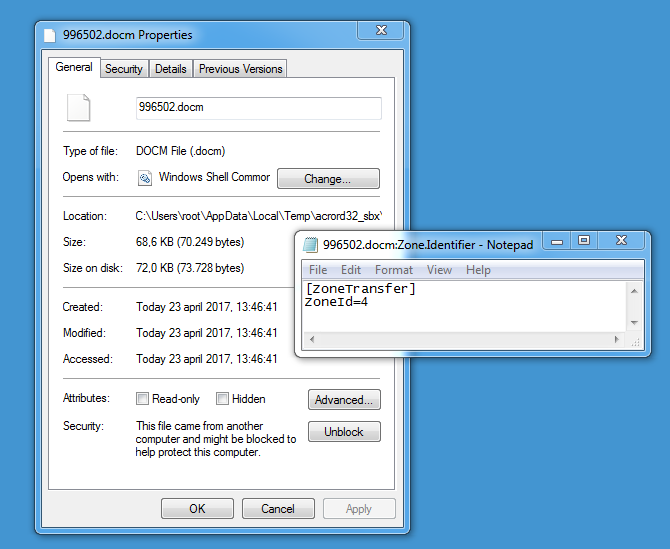 There has been a lot of talk about RTF documents exploiting CVE-2017-0199, making Word download and execute an HTML application without requiring any user interaction (except taking the document out of Protected View, depending on the presence of a mark-of-web). And this without VBA macros (RTF does not support VBA macros). After applying Microsoft's patch for CVE-2017-0199, a downloaded HTA is no longer executed, but it is still downloaded without user interaction. The attention that the RTF auto-update technique received (employed for delivering a CVE-2017-0199 exploit), will certainly stimulate the use of this technique for other purposes, like tracking.